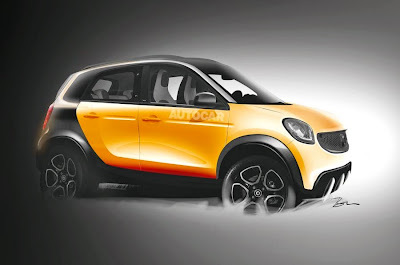 The Smart's plan will immediately realize a vehicle sport utility vehicle (SUV) seems not groundless. For the development of the SUV they also involve the French car manufacturer Renault. Currently both companies are still developing the design as well as how to make a rear-engined city car with unique looks. A subsidiary of Daimler and Renault already produces Fortwo and Twingo together in the Renault's Novo Mesto factory in Slovenia. This tiny SUV will be built by adopting the design of Smart Fortwo, Forfour, and Renault Twingo. This saw the three cars sales in Europe are pretty good. Thus, the presence of the Smart's mini SUV expected to boost sales. The supermini vehicles were more popular and predictable the baby SUV specifically for the urban will become a new trend in future. Similarly, as quoted from Autocar on Monday, May 18, 2015.